"As his legion of fans already know, Tommy Steele - Britain's first Rock and Roll Star - made his legitimate debut in 1958 starring in Rodgers and Hammerstein's Cinderella, which enjoyed a sold out run at London's Coliseum Theatre. What they probably don't know is that the inspiration for Tommy's extraordinary career was an American band leader whose music Tommy had worshipped from the moment he first heard it in his early teens. 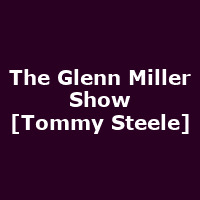 Featuring the authentic sounds of In the Mood, Moonlight Serenade, Little Brown Jug, Pennsylvania 6-5000, Tuxedo Junction, Chattanooga Choo Choo, and many more... ...the life, fame and untimely death of the big band leader whose music defined an era is celebrated in The Glenn Miller Show."